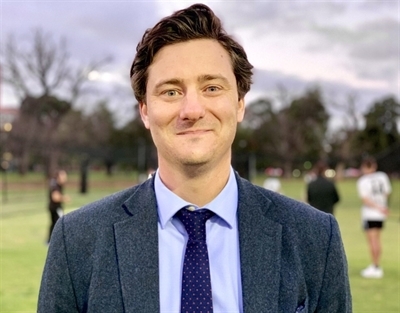 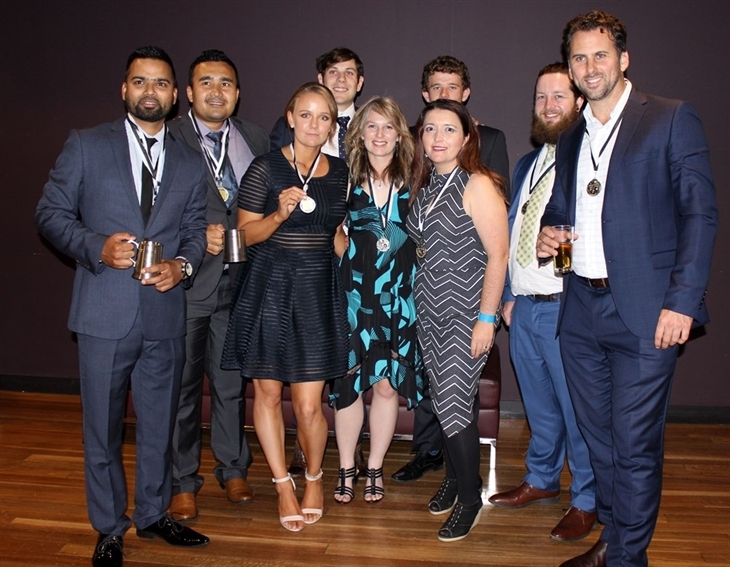 The 2018-19 Annual Awards Dinner saw big wins for Sam Kerber, Payas Bidwai, Nicole Collie and Paul Roberts. 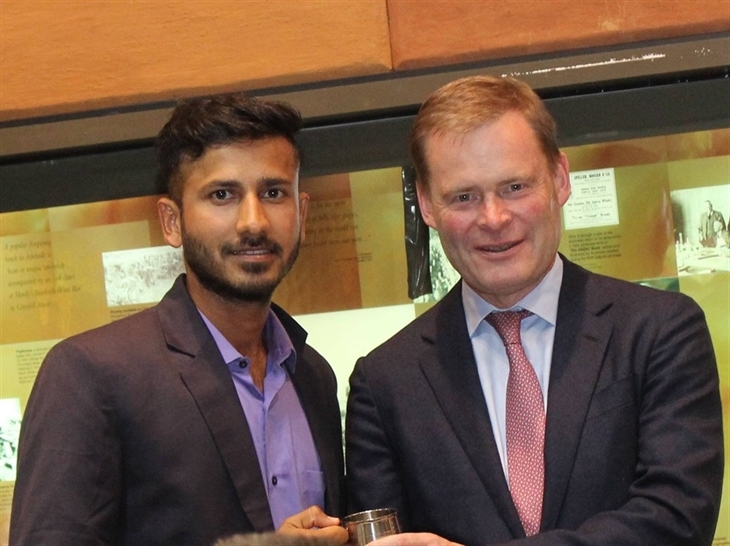 The event was attended by Vice Chancellor Prof Peter Rathjen in his role as Club Patron and he was accompanied by his wife Prof Joy Rathjen. 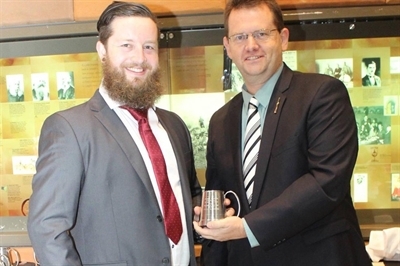 Michael David Award for Best Performance in more than One Grade Payas Bidwai. 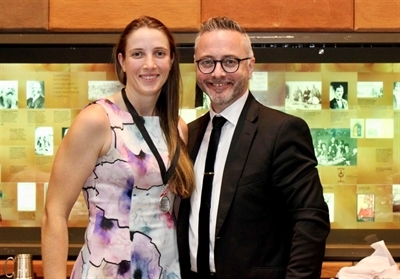 Nicole Collie presented with the Best Individual Performance Award by AUCC President Stephen Dickinson. 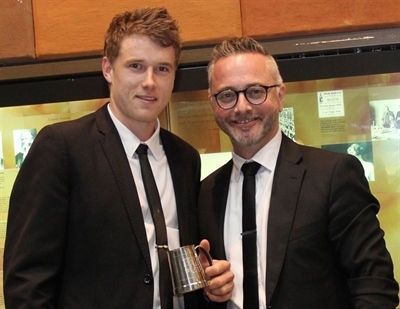 LO5 Captain Paul Roberts received the batting award for 490 runs. 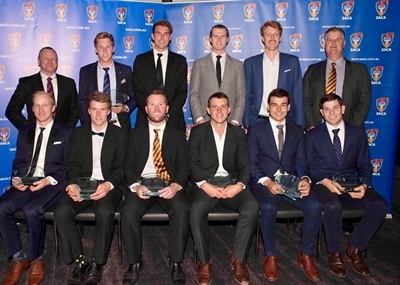 Ben Wakim, Sam Kerber and Bailey Wightman were all included in the SACA PC Team of the year for their outstanding contributions throughout the season. 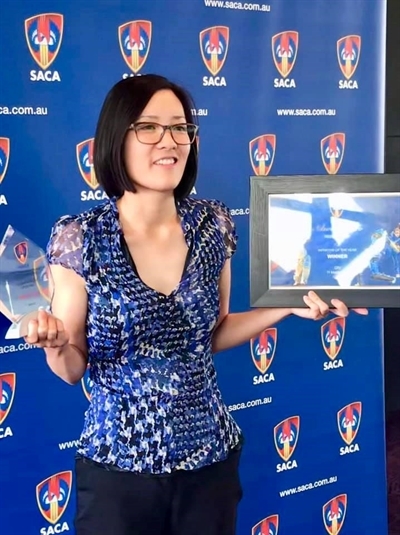 AUCC Women's Coordinator and Executive Committee Member, Rebecca Law was awarded the SACA Community Cricket Initiative of the Year Award for her work in developing the partnership with Mutuhara Adelaide, a Sri Lankan youth group, and getting them involved in playing cricket via the Strikers Girls League. 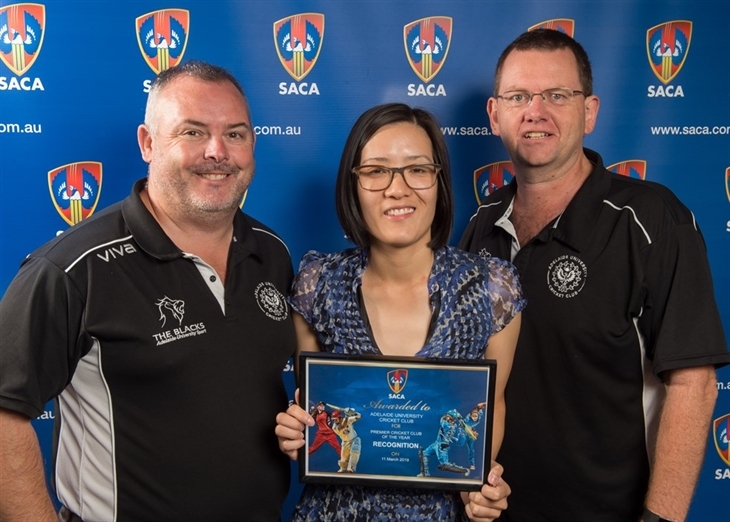 Rebecca Law collecting her SACA Community Cricket Award for Initiative of the Year. 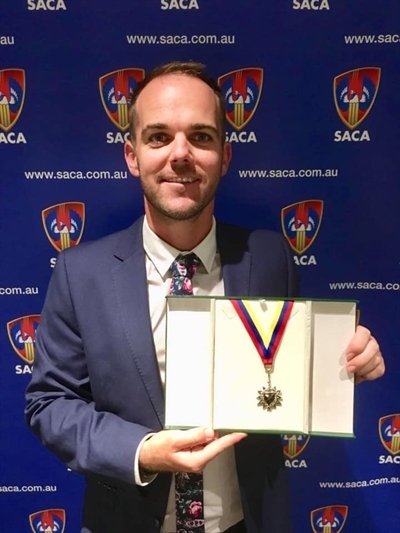 AUCC was also awarded a Certificate of Recoginition in the Premier Cricket Club of the Year Category for our work on and off the field developing programs for Women and Girls, our work with International Students and for our Association with Blind Cricket SA. 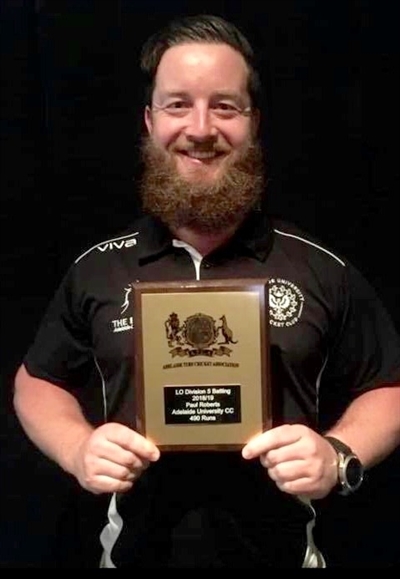 AUCC Club Manager Martin Southern, Executive Committee Member Rebecca Law and Women's Development Coach David Penn receiving the Certificate of Recognition for the Premier Cricket Club of the Year Award. 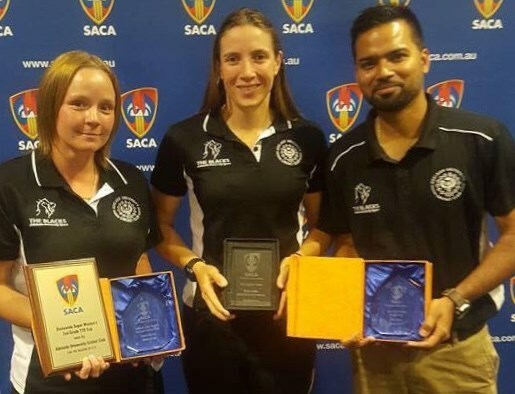 AUCC 2017-18 SACA Premier Cricket Awards Winners (L-R) Leanne Murray Women’s B Grade Bowling (16 wickets at 5.88), Nicole Collie Dot Laughton Award for best 1st or 2nd year Cricketer, and Rizvi Afraz Men’s D Grade Batting (440 runs at 62.86). 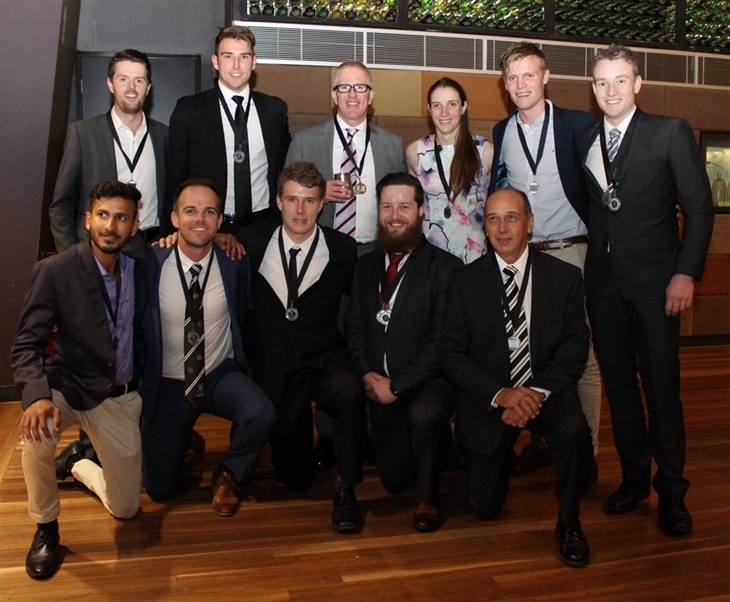 Not pictured is Rebecca Law who was awarded the Fellows Award for the Most Outstanding Volunteer in Women’s Cricket. 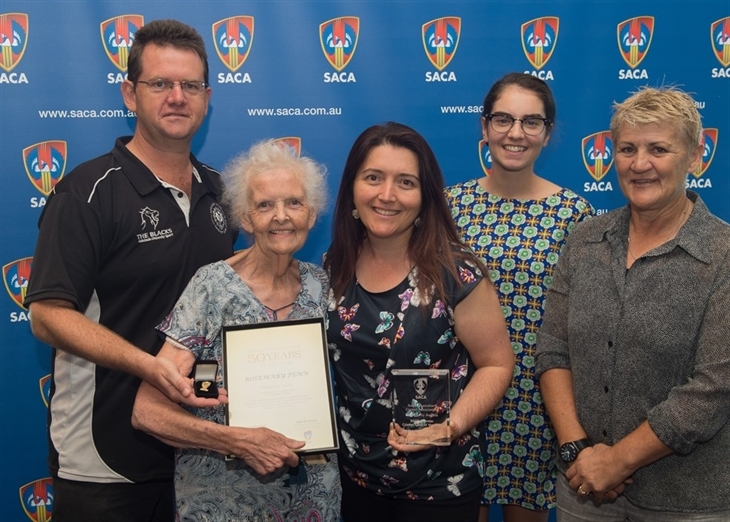 AUCC Award Winners at the SACA Community Awards (L-R) David Penn, Rosemary Penn 50 Years Service Award, Joleen Hall, Bonny Miller, Joanne Hedges. 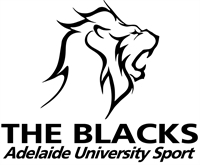 Adelaide University Sport have numerous annual awards including; Blues, Club Letters and Certificate of Merit. 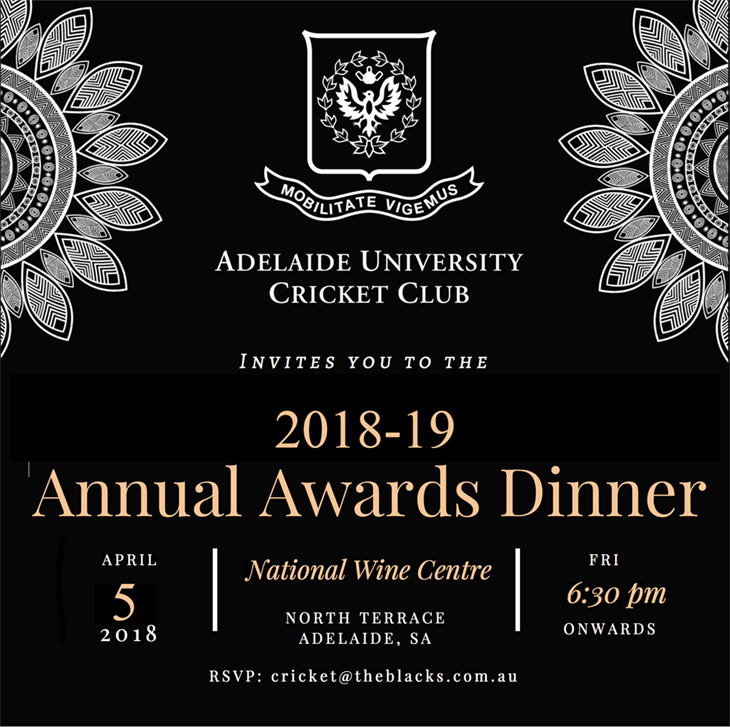 AUCC has been nominated for the Club of the Year for the first time.